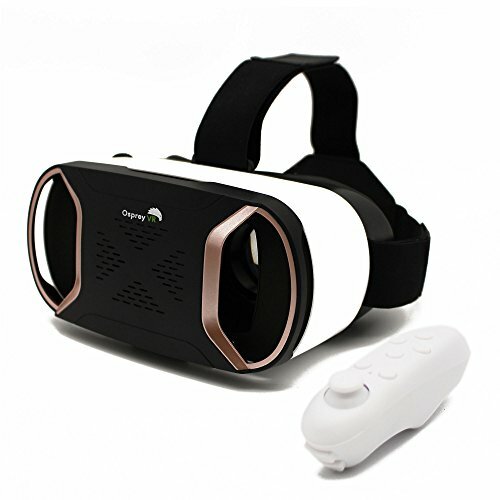 YOU WANT: A high quality reasonably-priced VR Headset that does not overheat your phone, and is compatible with all makes including Apple, Samsung, Android, and Windows phones; Reliable Clarity, Adjustable Lenses and Straps, and no fuss about incorrect adapters or defective USB connectors. Look no further than the OspreyVR! HEAT MANAGEMENT: Unlike the Gear VR, the OspreyVR's heat venting outlets on the front tray mean you can enjoy your VR experience without worrying about overheating your phone from CPU intensive VR apps . HIGH QUALITY WORKMANSHIP & MATERIALS: Reasonably-priced does not mean cheap quality! We start with durable shock-proof ABS plastic for the magnetic clip tray and main case. We use breathable perforated leather cushioning for eye comfort and premium adjustable head straps with leather patches. ANTI-BLUE LIGHT LENSES: Our polarized anti-blue light lenses help mitigate strain from AMOLED screens. They can be individually adjusted to support myopia of up to 750 degrees so you can enjoy a glass-free VR experience. The VR case is large enough to wear over glasses for those who prefer to use spectacles. VERSATILITY: The OspreyVR goggles work with your favourite audiophile headphones and any VR app that you like. No more trouble with adapters or defective built-in USB connecters! FUTURE PROOFED FOR AUGMENTED REALITY APPS: Unlike our competition, the OspreyVR’s rose gold accented front tray is specifically designed for Augmented Reality apps that use your phone camera while wearing the headset. BUY WITH CONFIDENCE with our 1 year 100% satisfaction guarantee! LIGHTWEIGHT VR HEADSET DESIGN: Only 340 grams with Built-in AUGMENTED REALITY outlets for your camera. No more fatigue - Suits adults and kids! They will love it! If you have any questions about this product by OspreyVR, contact us by completing and submitting the form below. If you are looking for a specif part number, please include it with your message.